1. To prepare the dates, chop them into ½-inch pieces. Combine the date pieces with the rum in a small saucepan and bring to a boil. Remove from the heat and stir. Cover and let macerate at room temperature for at least 4 hours (this can be done up to 1 day ahead). 2. To make the ice cream, warm the milk, sugar, and salt in a medium saucepan. Pour the cream into a large bowl and set a mesh strainer on top. 3. In a separate bowl, whisk together the egg yolks. Slowly pour the warm mixture into the egg yolks, whisking constantly, then scrape the warmed egg yolks back into the saucepan. 4. Stir the mixture constantly over medium heat with a heatproof spatula, scraping the bottom as you stir, until the mixture thickens and coats the spatula. Pour the custard through the strainer and stir it into the cream. Mix int he vanilla and rum, then stir until cool over an ice bath. Chill the mixture thoroughly in the refrigerator. 5. Heat the maple syrup in a small skillet or saucepan until it just begins to come to a full boil. Stir in the pecans, then cook until the liquid comes to a full boil once again. Stir the nuts for 10 seconds, then remove them from the heat and let cool completely. The nuts will still be wet and sticky when cooled. Chop maple-glazed pecans coarsely. 6. 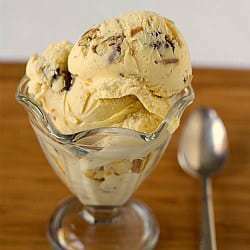 Freeze the custard mixture in your ice cream maker according to the manufacturer's instructions. During the last few minutes of churning, add the wet pecans and date pieces.